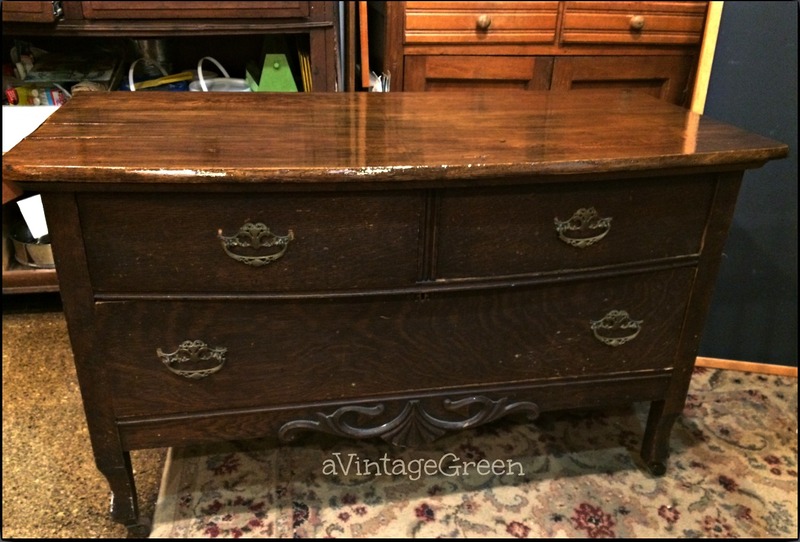 Project: bring the top of the dresser back, remove paint speckles from shellac finish and wipe down dresser with Restor a Finish, replace drawer stops. 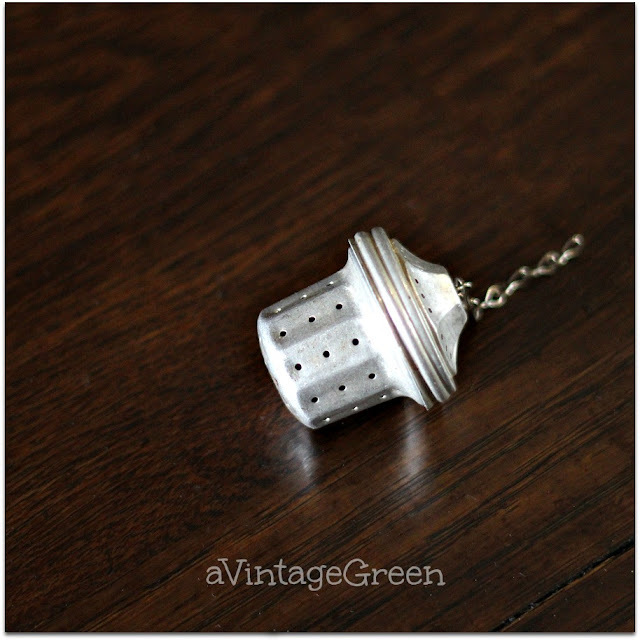 Below is the finished top of the dresser with a small very vintage individual tea ball/infuser. 3 drawer low dresser became redundant in our home and needed to leave but not before it was made beautiful again. Time: spread over a couple of weeks, about 5 hours actual working time. Cost: used materials on hand. 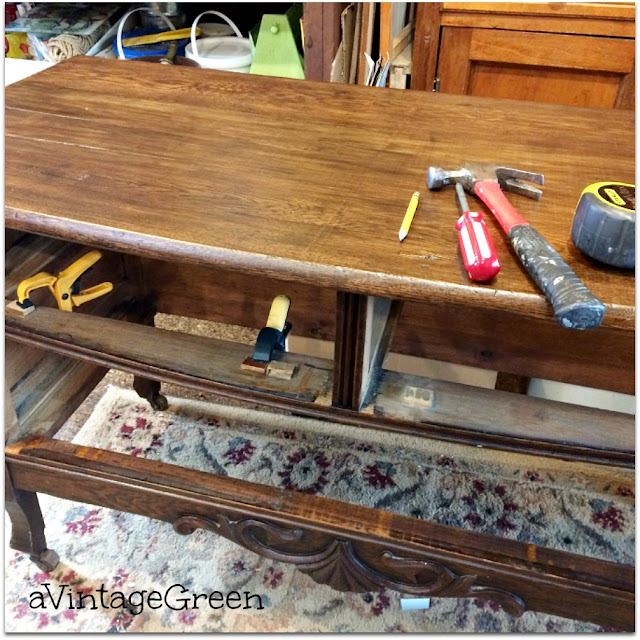 Useful piece of furniture - good for a flat screen television base, a base for a sink in a bathroom, a low dresser in a bedroom or mud room... I think it originally might have had a tall mirror attached and could have been a wash stand/dresser, just a guess. The beginning of the 'refreshing' the dresser was to fix the top issues. 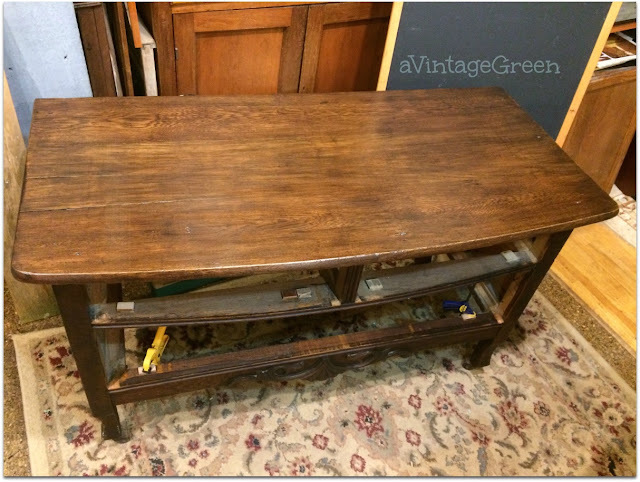 The original shellac finish on the top was beyond fixing so we used Methyl Hydrate, fine steel wool and folded cloth pads, muscle and time (and paper towels) to remove the finish. Top cleaned and bare, I liked that look but decided to try to match the dark brown to the drawer/frame section. 3 coats of Minwax 360 Tudor, rubbed light fine steel wool as needed between dried layers. The final finish was not as dark as I thought it would be. Picture below shows the final finish before it dried. While the Minwax dried I removing the speckles of white and silver paint on the drawer fronts and frame using a thin bladed knife, popping off any paint that would and then carefully chipped out the remainders. Below, a view inside the dresser and of one end plus a closeup of the wooden wheel, nice to have the original wheels still attached and in good shape, no cracks in the legs. I wiped the entire frame and drawers with Restor a Finish, lots of spider webs and dried out bugs gone, colour evened out. Getting closer to being finished, added drawer stops. 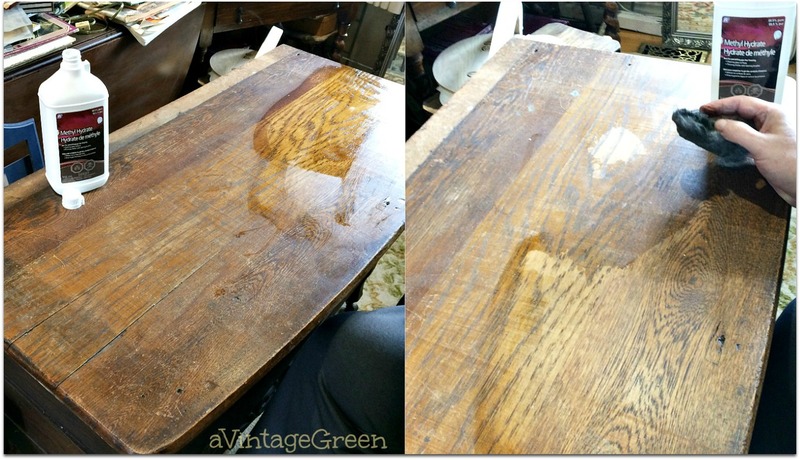 Brushed on ASCP Dark Wax to the dresser top, let it dry for a few hours and cloth polished off. Learned that dark wax takes a LOT of polishing. Fixed 2 more stops for the lower drawer. Finished. Evening photo below showing the colour more accurately. In brighter light it does look lighter. I looked around Pinterest and saw many lovely painted dressers of similar look used for a bathroom sink, laundry storage and folding surface, kitchen and living room furniture. All lovely, all unique. 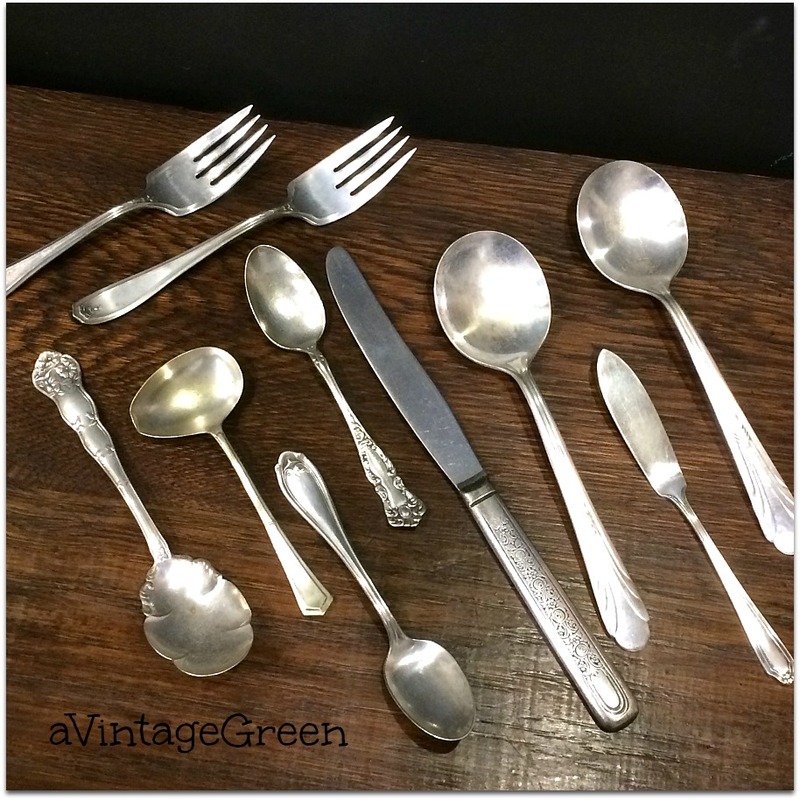 A few pieces of silver plate displayed on the dresser top, Estate Sale finds. Cleaned with the alum. foil, baking soda, vinegar and boiling water in a ceramic pan and then hand polished and used a bit of silver cleaner on the tough spots. Taking dresser to my booth. Second upcycled furniture project of 2017. 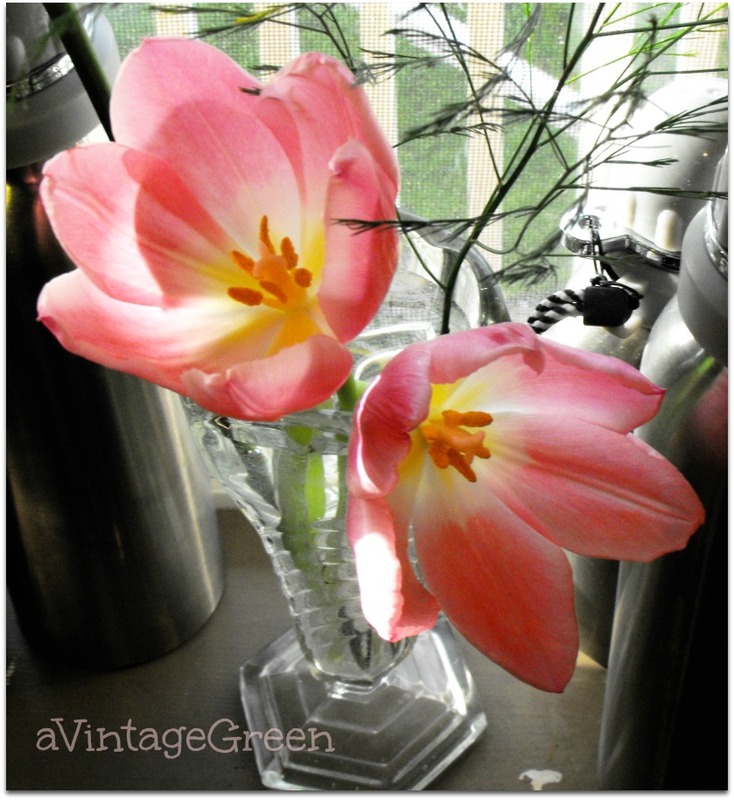 I decided to add a flashback photo on (some) posts so my first flashback is from March 16, 2011 - Pink Tulips from the garden (this year the tulip leaves are up, no flowers yet). Next post peek, hint below. 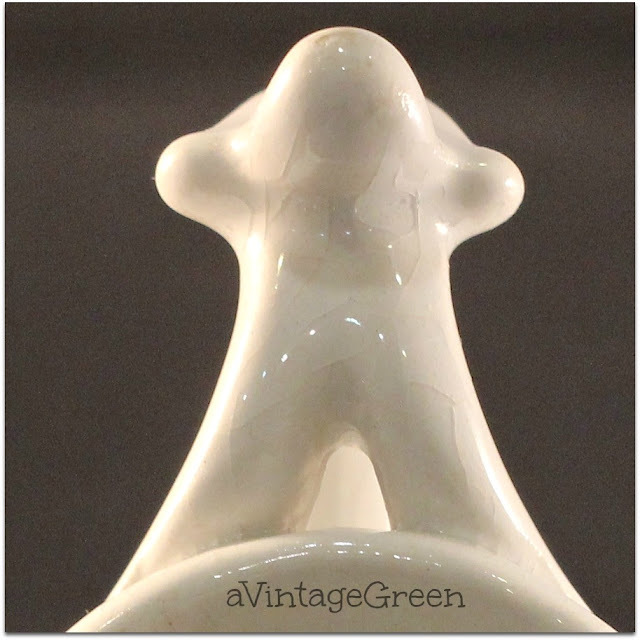 Picture reminds me of a gingerbread boy or maybe a giant marshmallow man (Ghost Busters memory). 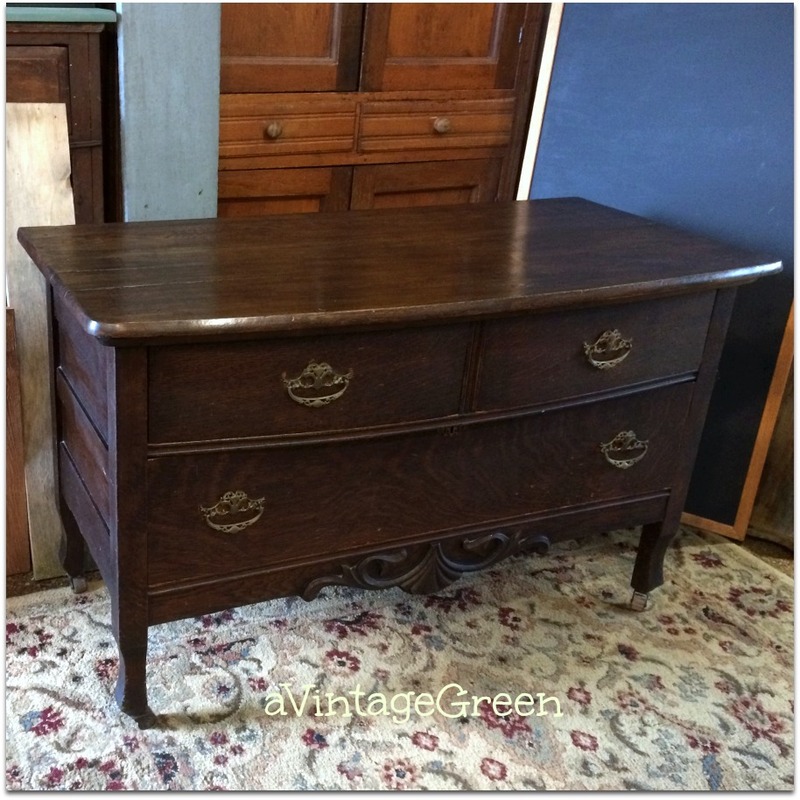 That dresser is gorgeous and I'm sure will sell. I love restored furniture. Oh those tulips are so pretty and have inspired me to try to paint some! Hugs! Gorgeous piece! You all do such fantastic work. I'm sure it'll sell immediately. Great job! That is a beautiful piece. I love how you break it down. We have some old pieces in our old house we use for storage. I'm encouraged that we may be able to bring some of these back to life. Joy, The dresser project turned out very fine. Good color matching I think. I will check back later for the full reveal because I have no idea who the ghost buster is. Thanks for sharing. Sylvia D.
We just remade a damaged piece that looked a lot lot that. Only a little taller. We made it into a rolling pot rack. Took the bottom doors and drawer out. Will hang pots down on the inside. Hubby made a butcher block top to put on it. Happy St. Paddy's day. Have a great weekend. 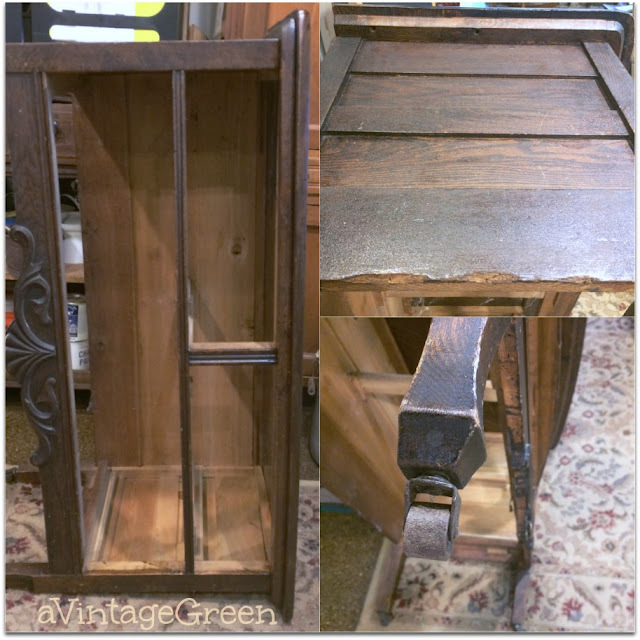 I love that you refinished the top yet kept the integrity of the original antiqued body, very beautiful. 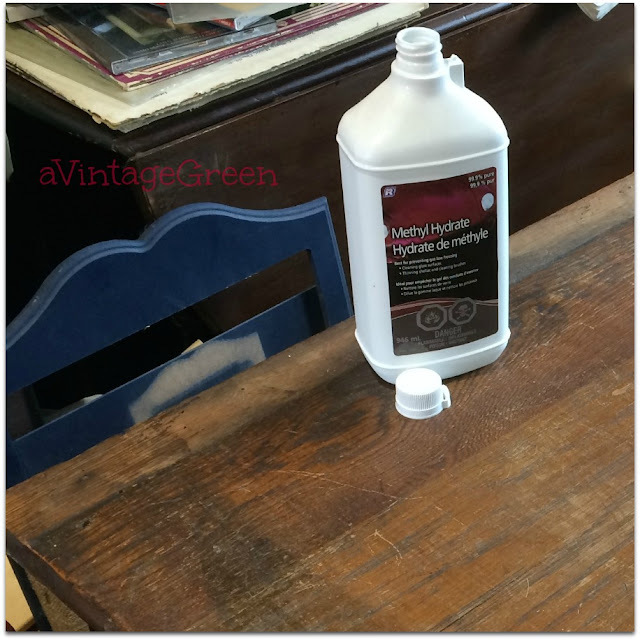 Thanks for sharing your tips at Fridays Furniture Fix! You've done such a lovely job bringing that wood back to being beautiful again. It should bring you a fine penny. While the trend seems to be to paint over any wood grained surfaces, I will not hop on that bandwagon because (to me) the grain & the warmth of natural wood is far prettier than a coat of paint. I came to visit you through Sweet Inspirations bloghop; one day I hope you'll have time to stop over at the 4Shoes & let me know you've been. Wow! It looks amazing! Thanks for linking it up with Funtastic Friday! The dresser turned out beautifully Joy. Love the silver plate! Thanks for sharing with SYC. Great job, that dresser really came back to life. Visiting from Brag About It. We have a family piece of furniture just like this and Mother has always called it a bachelor's chest. Yours looks wonderful! Thanks for sharing at Home Sweet Home! 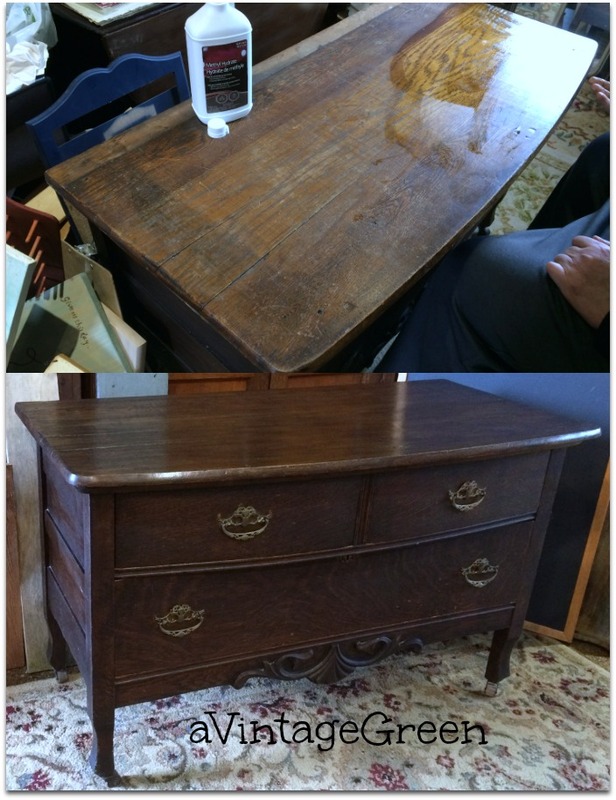 The dresser looks fab and will bring a lot of pleasure for many more years now that you've restored it so well. Thanks for the step by step tutorial and for sharing it with the MM crowd this week. 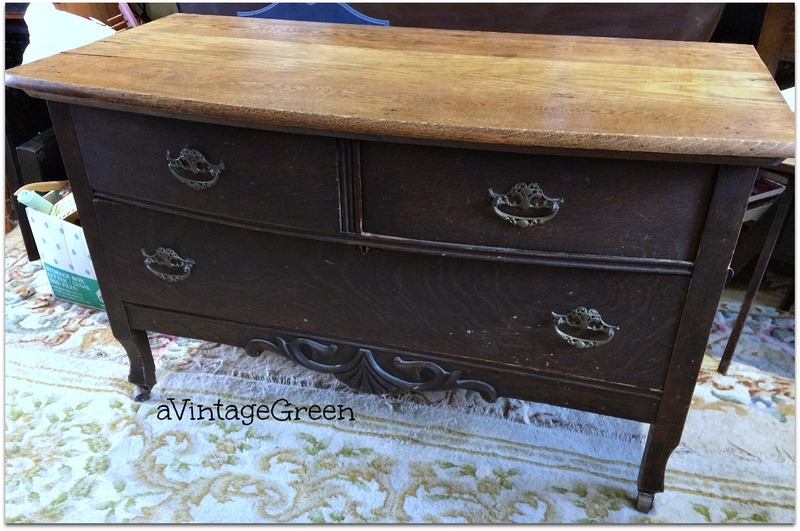 Joy that is a beautiful dresser and you managed to stay true to the original wood. I'm sure it will be gone from your shop in no time. Pinning! 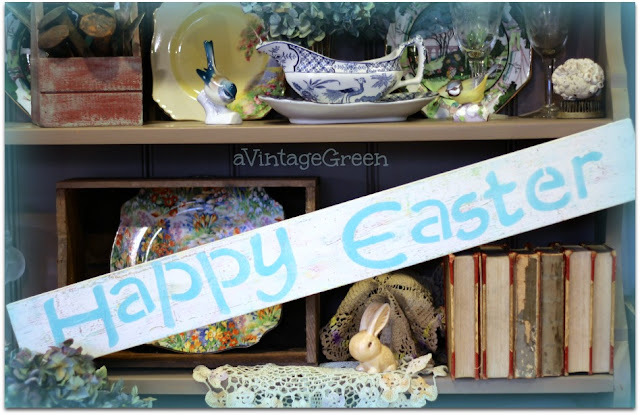 She's so pretty, Joy--what good work you do :) Thanks for linking up your work with us at Vintage Charm; it's always a "joy" to have you!! Looks like a lot of work but it turned out looking very nice. Thanks for sharing at the #WednesdayAIMLinkParty. I shared it on Pinterest. Joy, Thanks for sharing the steps you took to restore this little treasure. I think you did a beautiful job with it! Thanks for sharing with us at Brag About It this week. Curious about next weeks post :) Take care and Happy Spring! Pinned. Your hard work paid off. The dresser looks great! The dresser turned out beautiful! Thank you for sharing at Ravenwould!